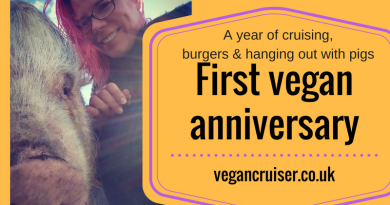 How’s the food – Can you eat vegan on MSC cruises? You may have read my blog and seen me enthuse about our generously sized balcony cabin. 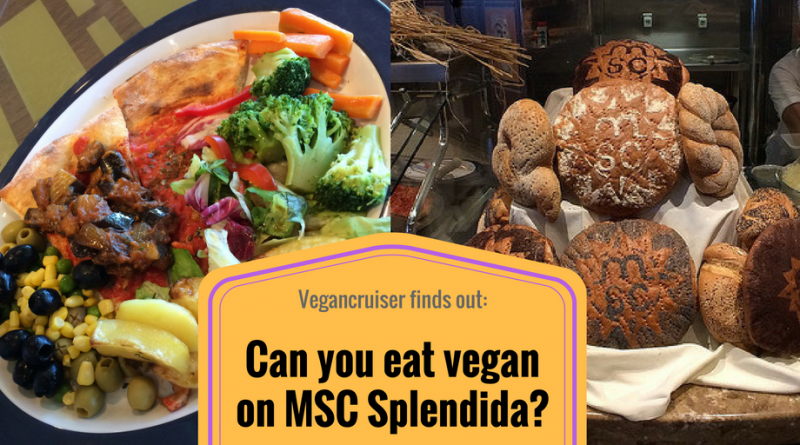 But from a vegan dining perspective, how did our three-night taster cruise on MSC Splendida go? How is the vegan food on MSC cruises? Generally, when I book a cruise holiday I notify the company 45-100 days in advance of my dietary needs. The notice period varies by company and region cruised – always check with the individual company with whom you booked. Once onboard, I check in with the main dining room (MDR) staff that they do have a note of my dietary requirements. Over the week I liaise with the waiting staff who take my orders for the chefs with whom they work. It becomes a team effort, discussing what is on the menu for the following day and spotting any ‘veganisable’ dishes (or for that matter, dishes that are already ‘accidentally vegan’). Due to the briefness of our taster cruise, I didn’t really have the opportunity to do any of that – though our group leader had advised the kitchen there was a vegan and one gluten-free cruiser in our group. My first impression of the Bora Bora buffet upstairs was that it was larger than many other cruise buffets I had dined in and that it had adequate seating – in fact, we always found seating when we needed. It appeared to be in great condition (fixtures and cleanliness) despite the constant use. I particularly liked the Polynesian theme as it made the venue feel more restaurant than a canteen. What I especially enjoyed and was very impressed by were the descriptions provided for each dish. Too often buffets only state the title of the dish but have no detail regarding. On MSC however, not only was each dish named in five languages, but a list of the main ingredients was also provided. Vegetarian dishes even had a wee carrot mark on the label indicating there was no meat or meat-based stock hidden – though as you can see from the photo above, this mark was missing from the roast sweet pepper dish that I was assured was vegan. Bora Bora buffet had the best detail on the dishes I have come across. Whenever I queried the use of butter, cheese or milk and possible egg in pasta dishes the staff members were quickly able to direct me toward the vegan options. My smoothest buffet experience in a long while and with a lot of choices too. I was really impressed from my first visit. Each day there was an oriental station with Chinese or other Asian food that always had a vegan-friendly stir-fry of some kind available and the remaining buffet stations had other vegetable dishes from which to choose. Being an Italian ship, Splendida had a fabulous pizza station in the buffet. 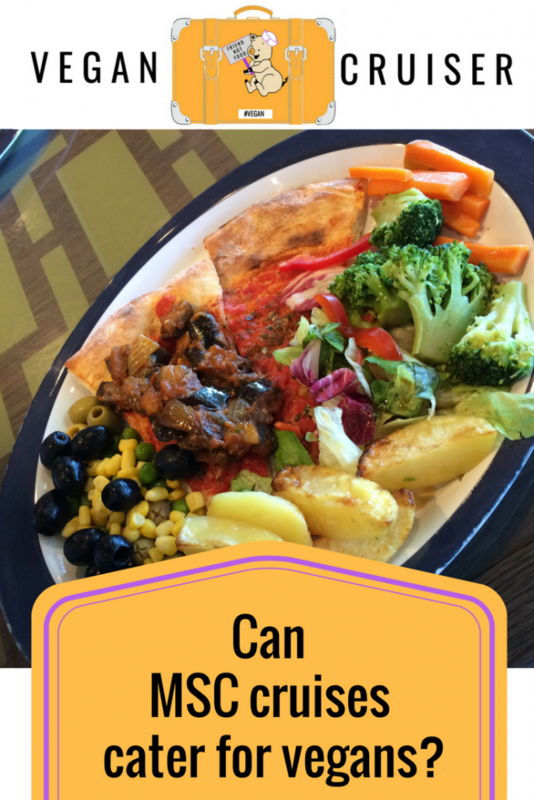 To my joy it always had slices of vegan cheeseless pizza available – all I had to do was to go round the other buffet stations and pick up vegetable antipasti, boiled or roast vegetables and other extras from the salad bar to go with it. One major win for breakfast time was the fact that the vegetable spread onboard was vegan and clearly marked so! On most cruise ships I have been on, and I am counting my pre-vegan days since I am lactose intolerant, options have generally been either butter or a vegetable spread with some dairy in it. In May I had to settle for using jam or breakfast fruit on my bread. On our August cruise, we had a fridge in our cabin so we took a tub of vegan vegetable spread onboard with us. No need to do that on MSC and I was able to enjoy all the fabulous German bread onboard with the provided spread. Soya milk was available too, though like on all the ships I have been on, I had to request it from the staff. My one disappointment over breakfast time was the fact that porridge/oatmeal was made with milk. Every other cruise line I have travelled with has served theirs made with water allowing customers to add milk, fruit or other toppings. Considering the rise not just of vegans but the increased (awareness) of lactose intolerance and the number of children with an allergy to the protein in cow’s milk it seems like such an easy thing to change to benefit many passengers. The wide range of cereal served was all German (as I spotted during the galley tour) so possibly vegan as continental brands do not automatically enrich their produce with animal-sourced vitamin (D) the way we do in the UK. Had I had a full week onboard I would’ve investigated their suitability to vegans further – but I as it was I was happy with the German bread & spread and my coffee at breakfast. On a week-long cruise, we normally take our dinners in the MDR most evenings. We may skip the MDR on a formal night depending on cruise line dress code (how formal dress they require). Because we were on a taster cruise, our group had a set dining programme to follow. 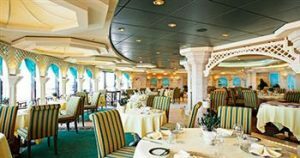 On our first night, my half of the group were invited to dine at restaurant L’Olivo which would otherwise be reserved exclusively for the Yacht Club passengers only (see my post about touring this suite class). I have no photos of the venue as I felt I couldn’t intrude. I have included a stock photo by MSC of our first dining venue instead. The menu given to me had one vegetarian starter and main – not as much choice as the buffet offered but that is the case on nearly every ship I have been on. I tried to query if the vegetarian-marked minestrone starter was also vegan with our waiter, but he did not seem to understand me. Was it my Scots-tinted accent or confusion at the concept of veganism? In the end, his supervisor stepped in and recommended tomato with tofu ‘tomato and mozzarella style’. Having had many a minestrone in my lifetime I decided to be brave and go with the recommendation. After all, interesting to see how a cruise ship prepares tofu. Unfortunately, it wasn’t prepared. My dish was sliced tomatoes and cold cubes of silken tofu with some olive oil drizzle. Points for trying to be innovative, but deducted for not really understanding silken tofu and how to cook and serve it. The vegetarian/vegan main course on the menu was a rustic lentil, vegetable and bean stew with crusty white bread. It was lovely but a small portion, especially as the crusty bread it came with, was just thin crostini slices. And the presentation was a little poor, as seen from the photo below. For dessert, there was no vegan choice on the menu. I was told my vegan alternative was lemon sorbet, the universal dairy-free dessert served on all ships. I often skip it but since my two previous courses had been light I felt I better have my sweet too. Forgot to snap a picture – but every vegan knows what a lemon sorbet looks like. After our one-and-only busy sea day (behind the scenes tour, presentation) our whole group met for dinner in the main dining room (MDR). Everyone around our table, including our one gluten free diner, was handed a menu. I was instructed that the chefs had prepared me vegan options and our waiter read out the set menu for me from a little note that he had for himself. My first course appeared to be straight off the menu: a plate with pita bread served with hummus and baba ganoush. A lovely plate of middle eastern food. The second course was a vegetable broth. My third course served was pitched as a vegan risotto. I was expecting maybe the traditional veggie option (in the UK at least) of mushroom or maybe pea risotto – but received this. I took two mouthfuls before taking this photo and as I couldn’t tell what I was tasting, I asked the waiting staff to find out what was in my dish. It took him a long time to check but when he came back he told me my dish was champagne risotto without parmesan cheese. Since I had no idea if the champagne used was indeed vegan (didn’t think the kitchen would know to consider animal-produce filtration of wines) I left rest of the dish. I didn’t mind as I knew what course would come next. 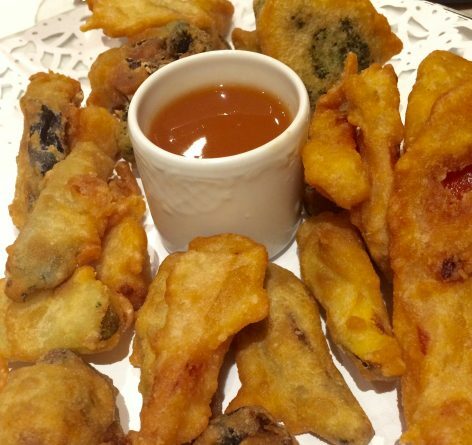 My fourth course consisted of deep fried tempura vegetables and curried dipping sauce. Another item straight off the normal menu and vegan too. I knew this as I had seen the menu card in the galley during our tour earlier that morning. My last course would have been the dessert – but I simply had no space after a plateful of tempura and the courses previous. I went to bed with a much fuller stomach than on night number one. Our group was once again split in half. Those who had not yet been to L’Olivo on the first night headed upstairs. We who had dined there on Sunday were instead directed to the Santa Fe Tex-Mex restaurant. This is a specialty restaurant (where additional charges normally apply) but as we were guests of MSC UK any charges were covered by our hosts. Once again I was advised a menu had been devised for me. While others selected items from their iPad menus I was left to see what the chefs would prepare. I was hopeful, hough, as Mexican food lends itself to vegan food so easily. What is easier than doing vegetable fajitas or some kind of bean-based chilli instead of the meat versions on the menu? My first course as it turned up was a veggie burger on a bun with some roasted vegetables including tomato and a nacho butterfly in a pile of guacamole. Not terribly Mexican and presumably same burger available in the burger station at the buffet. While my tablemates were between courses, I was brought a bowl of salad leaves and olives (still no beans).. which I consumed not knowing what else I would be served. When it came time for dessert, those of us who still had space for it, indulged ourselves. Can you guess what mine was? Lemon sorbet and plate of fruit, the two stalwarts of free-from dessert provision. Successful vegan dining on a cruise ship is normally is a result of a relationship between you and the kitchen staff. You work with a 24h delay and the first night of the cruise is the one where the kitchen has to improvise – the rest of your meals are planned with you. I didn’t have that continuity on this short taster cruise, so it feels a little unfair to be judging the vegan dining room provision based on this short trip and one night. Does MSC cater? Definitely. Did I go hungry? No. Did I eat vegan? Yes, with variable success. Most importantly – would I recommend MSC for another vegan? Yes, I would. Especially if you want a fun cruise that is excellent value (both the cabin and especially the drinks package) and you don’t mind eating in the buffet. On the basis of the food served in the buffet, I would return without hesitation. The labelling and vegan choice there was superior to what I found on offer in 2016 in buffets on either Princess or Royal Caribbean. Regarding the main dining room, I find it hard to pass any judgment based on one night with them. I think I would need a proper week onboard to see how they cater for vegan clients. The Mexican themed specialty restaurant really is of no value to a vegan the way it is set up just now. That could be changed so easily. After all, just think what chains like Las Iguanas (a popular UK Mexican restaurant food chain) or Chipotle (US) are able to offer vegans. And finally, would I travel with them again? In a heartbeat. In fact, I am looking at a particular MSC itinerary to visit Montenegro again. And if it meant dining in the buffet for a week – I’d be quite happy with that. 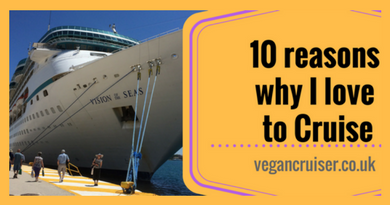 ← 10 Reasons why I love to cruise – and why I think you would too! 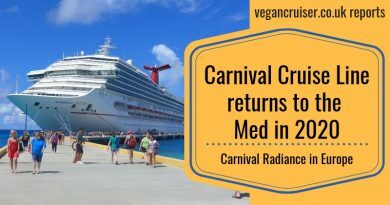 Carnival Cruise Line comes back to Europe with Radiance! 10 Reasons why I love to cruise – and why I think you would too! The universal dairy-free dessert served on all ships.